ChiDogO's, one of a handful of specialty hot dog shops to open in the District of late, is shutting its doors on Nov. 11 after barely a year in business near the corner of 14th and U Streets NW. Prince of Petworth has the scoop. An employee confirmed the closure for Y&H last night. Its displacement will make way for one of ubiquitous architect Eric Colbert's latest condo projects. Operators are planning to open a new shop in College Park. On my first visit to ChiDogO’s, my foot-long was warm but not hot, and lapped with spicy full grain mustard. The link itself (from Vienna Beef Ltd., based in Chicago) was a mildly flavored steamed dog devoid of smoke or personality that would distinguish it from other hot dog suppliers. A pair of bright, vinegary peppers packed heat, but the tomatoes were unripe and flavorless. Onions and a pickle spear were bright and crunchy, and muddied with the expected, and much appreciated, dusting of celery salt. The relish, however, left me confused. After talking to a number of Chicago natives and eating at DC-3, I was expecting a distinctively sweet, bright green number with a radioactive appeal. 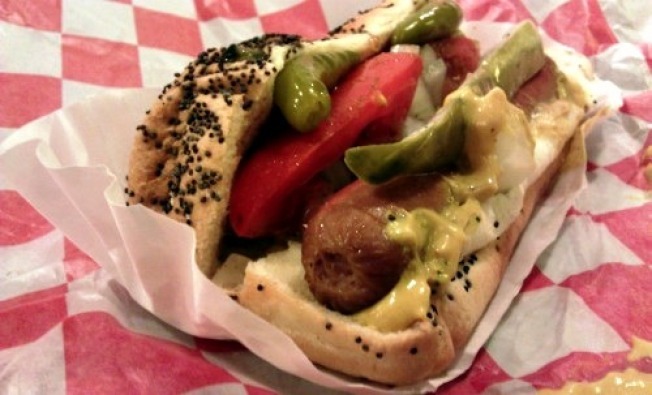 ChiDogO’s relish was grayish and tasted flat, as likely to come from a plastic Hunt’s packet as a specialty Chicago provider. According to [proprietor Robert] Hisaoka, all of his toppings hail from Chi-town except the onions, tomatoes and other fresh condiments. When I badger him on the relish matter, he concedes the neon green varieties’ popularity, but says he decided on his chosen relish after a number of recipe tests. He won’t tell me what brand he’s using, citing competitive concerns. So Long, ChiDogO’s, We Hardly Chewed Ye was originally published by Washington City Paper on Oct. 28, 2011.